Sorry, we don't carry Barient or Barlow spare parts - please visit the Australian Yacht Winch Co. for these items. Harken made a big announcement at the 2009 U.S. Sailboat Show at Annapolis: A new line of winches, called the Radials. But unlike other "new" winches that are merely a 2.0 version of an existing product, Harken literally started with a blank sheet of paper and built from the ground up. The resulting winches are lighter, more efficient, safer, easier to install, and easier to upgrade to powered units than any other winch available on the market. Perhaps the biggest visual difference with the Radials is the distinctive "radial" pattern that surrounds the rope-bearing sections of the winch's drum. These lines provide solid grip on the rope while also helping to avoid line overrides. While Harken was pleased with their older winches that feature sandblasted and knurled bearing surfaces, they realized that there was room for improvement. Plus, they also realized that the grippier a winch's bearing surface, the more frequently running rigging needs to be replaced due to abrasion. Harken claims that the shaped radial design on the drum’s bearing surface relies on "shape—not-friction" to grip the line, thus saving running rigging from undue friction. The resulting radial design purportedly acts like a screw, guiding the line down during easing, keeping the wraps where you want them. The design also provides great line grips during sheeting. 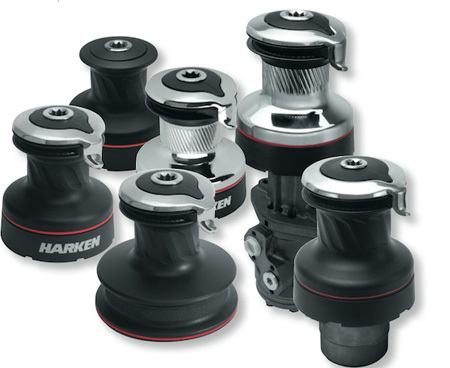 Harken's new Radial winches are roughly one third lighter than their older units. If you are considering a boat with six to eight winches, this can quickly become a significant weight reduction, even for cruisers, which is the target audience for the new Radials. But Harken didn't stop at weight savings: By adding a solid metal covering on the winch top, they have created a winch that will not ingest clothing or fingers from the top. One of the great features of the new Radials is how easy they are to convert into powered units. Another great feature of the Radials is how quick and easy it is to open the winches up for servicing. Simply remove the winch’s top and all parts lift out as a single unit, making servicing and reinstallation a snap. Harken also considered the boatbuilding trade when designing the new winches, as Radials are far simpler to install than previous winches.